With the All-Star Game in the rearview mirror, it is already time for the Tampa Bay Lightning to put the excitement of the weekend behind them and look to build upon their current high-level of play. Not only did the team string together three consecutive wins against strong opponents before the break, they looked like the Lightning of old in the process. Whether it was due to a missing Victor Hedman or just rust after the bye-week, the Lightning weren’t on the same page during these games. The offense wasn’t scoring, the defense wasn’t defending and goaltender Andrei Vasilevskiy wasn’t stopping the easy shots. Even in the shutout win against Chicago that kicked off the current winning streak, the Lightning were far from perfect. It took a Herculean performance from Vasilevskiy to preserve the shutout and get the good feelings going again around the team. After shutting out Chicago, Vasilevskiy went on to give up only one goal against the Flyers, posting his league-leading 29th win of the season. These two games were more than just wins for Vasilevskiy, though. These wins were reminders to himself of why he is a serious Vezina candidate. It can be difficult to remember that he is only 23 with how mature he plays in net. Being so young, he is still experiencing the rigors of a full NHL season for the first time. His stretch of giving up 23 goals in five games is the perfect example of how difficult a season can be on any goaltender. When things are going poorly, you start overthinking what is usually second nature. The recent dominant performances will serve as a reminder for the young netminder that some struggles are okay as long as you can find your rhythm again. If Vasilevskiy had struggled in his last two games before the All-Star weekend, it likely would have ruined the event for him. Those two great performances before the break were the perfect scenario, giving him the opportunity to enjoy the festivities of the weekend without the cloud of a few bad games hanging overhead. The scoring started with a shorthanded goal from veteran winger Chris Kunitz in the second period against Chicago. From that moment on, the Lightning seemed to regain their offensive touch, scoring 11 goals over the next three games. It’s been more than just the highlight-reel scores from Nikita Kucherov or Steven Stamkos that fans have become accustomed too. Players up and down the line-up, from Kunitz to rookie Yanni Gourde, are contributing on a nightly basis. Gourde scored three goals in three games, including the game-winner in Nashville, pushing him to 17 goals on the season. Similarly, Vladislav Namestnikov scored three goals in his last two games, giving him 18 goals during his breakout year. In Philadelphia, Ryan Callahan turned back the clock about six years by scoring a perfect shorthanded dangle to put the Lightning up 3-0 against the Flyers. While Stamkos had the tying goal in Nashville to pull out a win in a game that looked like a lost cause, both he and Nikita Kucherov have been in scoring slumps, relatively speaking. With that, the production from the Lightning’s bottom lines has been needed to put the team back on the winning track. At the All-Star break, Tampa Bay was in a unique scenario among professional sports markets. Not only was the city hosting the 2018 All-Star game this season, they also had the top team in the NHL. Rarely in any sport do you see a major event like an All-Star game occur in the same city as the best team in the league. The Lightning were well represented at the All-Star game this year, but with the festivities over it is time to look forward to the rest of the season. 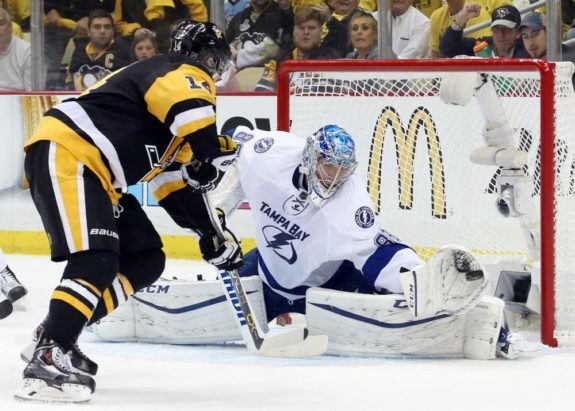 With the playoffs not far off in the distance, the Lightning still have a lot of work to do if they want to reach their ultimate goal of a Stanley Cup.